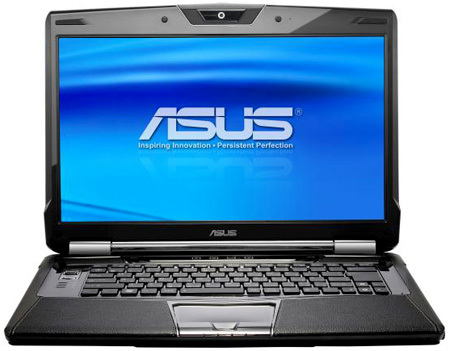 Review It’s hard to see who Asus’s supercar laptop tie-ups are aimed at. If you have the money to buy a Ferrari, a Porsche or, in this case, a Lamborghini, will you really be going for a £1,700 portable to remind you what’s in the garage. If you drive a lowered Golf with blue neons underneath, wouldn’t you want a VW laptop? We guess the Asus VX5 is all about aspiration. Asus' Lamborghini VX5: more bling than luxury? A big, desktop-replacement laptop should be able to handle anything you would throw at its not-so-portable predecessor but, above all, it should remind you of a sports car you’re never likely to afford. Acer dreamt up the idea of supercar tie-ins with its Ferrari laptop and Asus has taken up the challenge with the VX5, which is tied in with another renowned Italian marque, Lamborghini – the Lamborghini Reventon, in particular. The VX5 comes in black or white and declares its heritage with a Lambo bull badge in the middle of the lid and shallow louvres behind. Open it up and there are a number of other trim tweaks, such as leather covers to the wrist rests in front of the keyboard and metal trim around the edges. 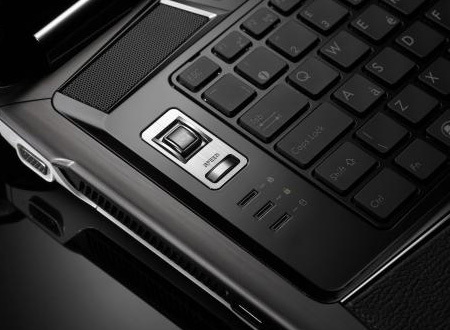 There’s a smooth ceramic touchpad and a conspicuous button to the left of the keys, marked ‘speed’. The button switches between ordinary ‘Entertainment Mode’ and ‘Twin Turbo Mode’, which overclocks the FSB by 100Hz and the video chip by 25MHz, but only when the VX5 is plugged into the mains. It didn’t seem to make much difference during testing, but the machine ran pleasantly cool in both modes, though it’s one for the desktop, not the lap. The spec of the VX5 is perhaps more Mazda RX8 than Lamborghini Reventon, even by Asus standards. Based around a quad-core Q9000 processor running at a reasonable 2GHz, with 4GB of DDR 3 memory and twin 500GB, 5,400rpm hard drives, graphics are geared more to 2D than 3D. The 1GB GeForce GT130M is fast for a mobile GPU, but not as quick as the 8700M and GTX260M, found in more athletic games vehicles, like the Asus G70 and G71Gx. The speed button: so when would you want it running slowly? The VX5 aims more at the video enthusiast, with a fully 1080p HD display from its 16in, 1920 x 1080 panel. This is sharp, clear display, but would benefit from being a bit brighter, particularly at its corners. Above the screen is a 2Mp webcam. That’s the description of our review sample, but machines are now shipping with 1368 x 768 screens, which aren’t nearly as nice and are, of course, not full HD. We had to instal Windows 7, too, as the machine arrived with Vista.